I just finished reading Rachel Roddy's My Kitchen in Rome: Recipes and Notes on Italian Cooking, which was reviewed in the latest issue of Edward Behr's always-thoughtful The Art of Eating. Roddy is an Englishwoman who discovered Rome in the course of her travels in Italy, fell in love with the city and never left. This book is a love letter to Roman cooking, celebrating its humble simplicity, seasonality, focus on good local ingredients and tradition, as well as the people involved in the food business in her neighborhood, Testaccio, a working class quarter that seems to be gentrifying. 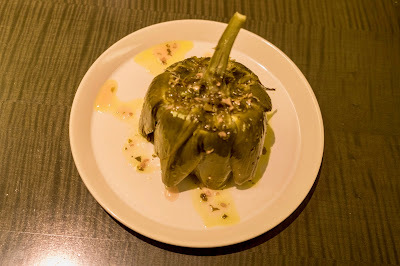 Whereas the food of Sicily had thrilled me, the food of Rome tripped me up and then pulled me to my feet, charming me with its simplicity, certainty and bold flavors -- notably the primi, or first courses. A deep bowl of pasta e ceci scented with rosemary, spaghetti coated with a seductive creamy sauce that's nothing more than eggs, cheese, and cured pork; more spaghetti, glistening with olive oil, flecked with parsley and clams, and tasting indignantly of the sea; a plate of stout potato gnocchi, no bigger than acorns, topped with bright red sauce and a blizzard of pecorino cheese. I quickly realized I didn't just want to eat these dishes, I wanted to understand them. I wanted to make them. Don't you want to run out and get some indignant spaghetti with white clam sauce? When you get to the simmering, the heat should be low and the simmer tremulous, the kind that has you checking that the flame hasn't gone out because the pan looks so still, then you lift the lid, look closely, see that the surface is quivering and suddenly -- plop! -- a burp of a bubble breaks the surface of the soup, and you are reassured that all is well. How can you not rush to the kitchen and make minestrone? This is a cookbook,so what of the recipes? In general, they are somewhat sketchier than those to which I am accustomed. the ingredients and quantities are there (translated from metric so lots of odd measurement, but that's fine), but the techniques presuppose that the reader can cook. I made a dinner for my friend Cochonette, which started well with a plate of fava beans and pecorino, with a Negroni cocktail, both suggested by the book, while we waited for the trippa alla romana (Roman-style tripe) to cook. The beans and Negroni were lovely, but the tripe was a disaster. I followed directions, washing the tripe in hot water, then plunging it into boiling water "for a few minutes." Well, my few minutes was probably an hour short, and I more or less gave up on this dish after adding a half hour to the actual cooking time; even reheated and braised for another half hour, it did not reach the desired tenderness. But tripe is a specialty thing, and I am no expert on tripe, so I chalked that up to my lack of experience and moved on. I then invited my friends M and V for dinner, and made Roddy's carciofi alla romana (Roman-style artichokes), which strongly resemble those I have been making for years but in any event were a big hit, followed by her ragù con le spuntature (pork rib ragù) served over (unfortunately pasty store-bought) gnocchi. 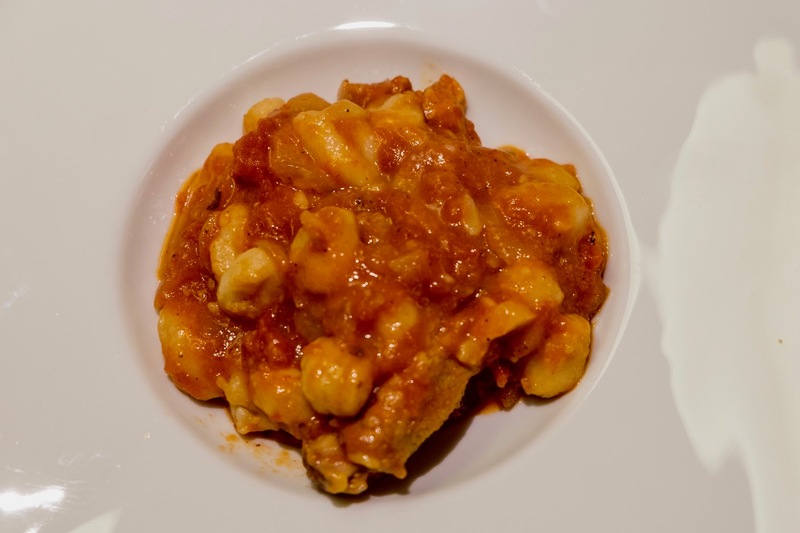 This sauce, which consists of onion, pork ribs, canned tomatoes and salt and pepper -- no garlic, rosemary, red peppers -- was wonderfully clean and complex, the pork mingling with the tomatoes to produce an unexpected symphony of flavors. 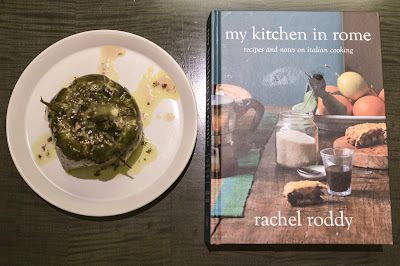 The book contains many other recipes that I plan to make, in various categories, although I would generally compare hers to my many other versions to see whether Roddy's diligent approach results in the most authentic recipes or ones that add to the already extensive literature. Surely she has a feel for Rome, so I am optimistic. This should not be your first Italian cookbook, or even your third, but it certainly deserves a place on my shelf. More important, having read it, I WANT TO GO TO ROME!